The product "DVD The History of Motor Racing 1950s - a golden decade" was successfully added to your wishlist. It was during this golden decade that some of the world's most influential manufacturers and drivers made their mark, leaving us with an extensive archive of dazzling technical innovation and exciting characters. 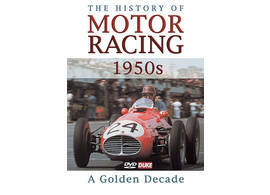 Featuring Ascari, Fangio, Moss, Hawthorn, Collins and Musso with Ferrari, Mercedes, Lancia and Maserati.